It finally feels like I am settling into this and I don't think it's just that it was a sunny day, though that always helps. It may be partly that I have enough blocks now to get a better sense of the bigger picture, and to be able to tweak away at any given section until I find exactly what I want. Of course this is not the finished article; I'm a shed-load of blocks short of where I need to be, for starters. There's a spare circle block which may or may not make it in and two of the four you can see here may be moved, though only a tiny bit. However, I am happy enough with the bottom part to start stitching things together into bigger chunks - no photos of this because, for utterly boring reasons, I am working in the tiniest space ever, but it is happening. And I'm still making those strings. Linking up today with Sew, Stitch, Snap, SHARE. I like the way this is growing. Those large triangles are really lifting it. I do like the addition of the rainbow-like blocks. They add charm and a softness compared to all the straight lines in the quilt. It's looking great. I'm always amazed what you come up with. I haven't read Jen Jones book but, I know she's quite a legend. I have a book called "Quilts and Coverlets - The Beamish Collection" that is pretty wonderful too. Excellent! I am seeing this quilt top coming together. I like the dark, moody colors of this one. Yes - yes - YES!!!!! You found it - keep going!! Those quarter circles are just the right size and add so much wonderful energy! Looking good! It's been so interesting to watch this develop from an amorphous start to something with personality. Pushing on with more blocks has made a tremendous difference. I'm enjoying the unexpected bits like circles and pluses. Smashing Kaja - it's looking so good! I am just catching up today as it has been a crazy couple of day with moving my office. The top is coming along great! The mix of color and pattern is looking very well balanced. This is looking great. I made one in... it is so long ago I am not sure of the colour, red/orange. It is on the waiting to be quilted pile. I think I am going to go back to blogging. I am so sick of Ig and the way everything is shuffled so i don't see the most recent posts and then I miss things NOT to mention all the ads. I love your color choices for this quilt, Kaja. And the blocks have lots of movement, too. It's interesting how the center diagonals create a large, on-point square in the center of the layout in this photo. I especially like the addition of quarter circles. If this were music, they would be grace notes. Goodness, Kaja! It's really beginning to take shape. I like those quarter-circles interspersed with the angles. I think they add a soft feminine look without being "too girly." Love it! Lovely to see this coming together and some decisions made on the its direction. And what a diffeence a bit of sunshine can make! 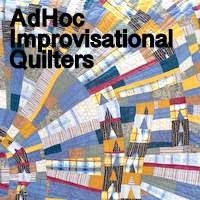 Ohhh, this is a really exciting quilt. I love the dynamics of this. Keep those strings coming...you've got something great here!